Philip Mayeux, Ph.D., SPaT program director and professor in the Department of Pharmacology and Toxicology, has renewed a T32 grant for $742,840 over five years. The grant supports two trainees in the biomedical sciences as they gain additional training in pharmacology and toxicology. July 23, 2018 | July 23, 2018 | A prestigious grant has been renewed for $742,840 over five years that gives Ph.D. students in the biomedical sciences at the University of Arkansas for Medical Sciences (UAMS) an added foundation in pharmacology and toxicology research. 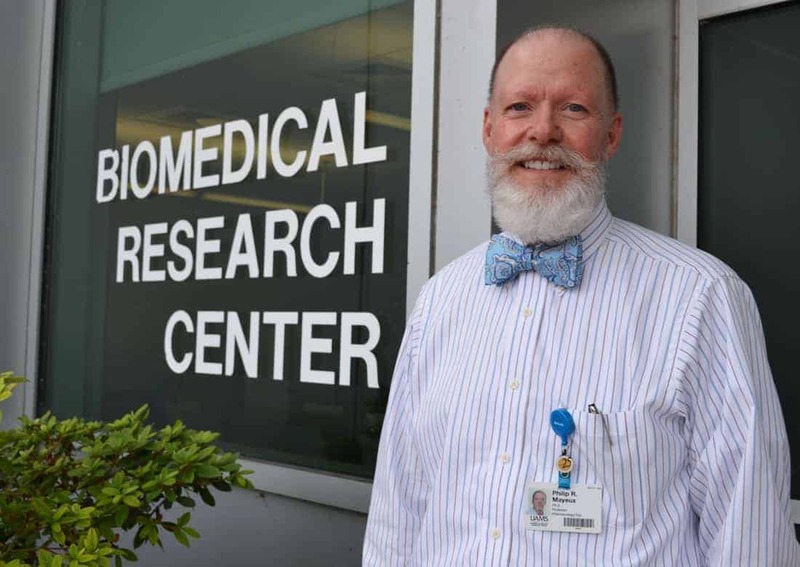 The National Institute of General Medical Sciences awarded the Institutional Predoctoral Research Training Grant (T32) to the Department of Pharmacology and Toxicology in the UAMS College of Medicine. The funding will allow the department’s Systems Pharmacology and Toxicology (SPaT) Training Program to provide two trainees a year with a stipend, specialized coursework, research mentorship and training in entrepreneurship, career development, networking, leadership and grant writing. “The prestige of the grant helps us recruit the best trainees from across the country to our program,” said Philip Mayeux, Ph.D., SPaT program director and professor in the Department of Pharmacology and Toxicology. UAMS is one of only 31 pharmacology and toxicology training programs in the nation to receive the funding. Others include Vanderbilt University, Emory University, Harvard Medical School and Johns Hopkins School of Medicine. The trainees come from a variety of areas of interest and pursue research that combines these interests with a focus on pharmacology and toxicology. Trainees supported by the first grant worked on drug abuse and behavior; cancer; drug toxicity; and bone, kidney and cardiovascular health. Thirty-one UAMS faculty have partnered with the SPaT Fellowship to provide training and mentorship. SPaT is a partnership of the UAMS’ Graduate School, College of Public Health and College of Pharmacy; Arkansas Children’s; and the National Center for Toxicological Research, which is part of the Food and Drug Administration. The UAMS College of Medicine and Arkansas Biosciences Tobacco Research Committee provide matching funding for the grant, allowing there to be one additional SPaT trainee each year along with the two funded by the federal grant.